On a recent trip to Toronto I was able to get together with a good friend from my undergrad years at McGill University, Katie Reed. 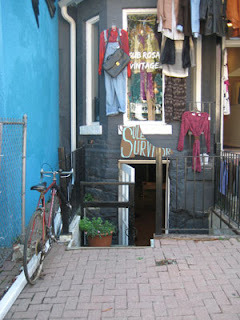 We met at her shop, Sole Survivor, in Kensington Market. 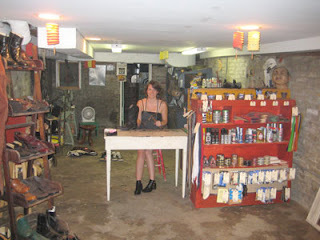 Katie, who is 28 years old, has owned and operated this cobbling business for two years. 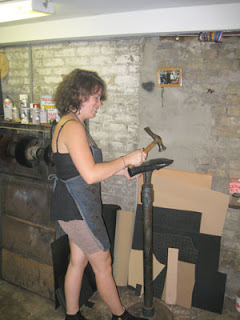 As a young woman, she bucks the cobbler stereotype (in fact, she is the only female cobbler in the Greater Toronto Area). After a B.A. from McGill and teaching jobs in Japan, it certainly wasn’t a career path her friends imagined for her. But like all her undertakings, she has thrown herself into it completely and made it a success. It has required a lot of hard work and determination. Just finding someone in the GTA to apprentice her was a seemingly insurmountable challenge: she was turned away by all but one of the working cobblers in the region. Now that she is experienced and established in this trade, she is taking on an apprentice of her own (another woman) to pass along her knowledge. Katie is keeping our favourite shoes in tip-top shape (including finance ministers at budget time! ), which can save us precious pennies. 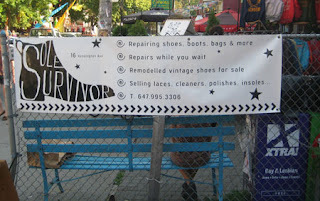 She is also keeping many out of landfills, a great way to lessen our footprint (if you’ll pardon the pun). Ryersonian.ca has a short video featuring her and her work. Click here to watch. 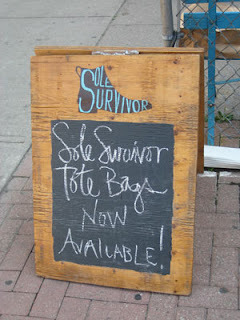 Katie also has a blog for here: https://solesurvivorcobbler.blogspot.com/.